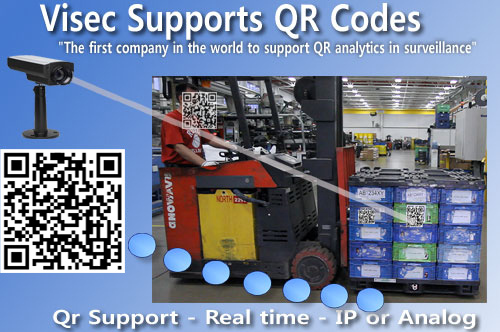 Visec releases QR analytic module that can automatically read QR codes at a 99.9% accuracy rate. This module is an add-on to the Visec® IP camera software application. It can automatically read QR codes at a 99.9% accuracy rate. Multiple QR codes can also be read simultaneously with a single camera. The QR algorithm has the ability to rapidly process large amounts of data with a very good error correction. QR code technology is becoming more ubiquitous in every facet of business. Integrating QR technology into existing video surveillance applications creates new opportunities for the video surveillance industry. Such solutions can now be used as a low cost alternative to effectively compete with RFID technology, Barcode and other analytical solutions." 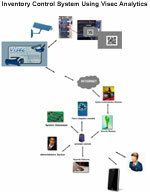 QR modules allow security vendors to create new markets with their existing clients. Traditionally, a business might incorporate video surveillance cameras to protect its inventory. Now, with technology like the Visec® QR module, the same company can use existing video surveillance solutions to reliably track merchandise and ensure optimal logistical flow, all automated and with a minimal investment. QR codes are two dimensional bar codes usually the size of a postage stamp, that store data both vertically and horizontally. The technology has just recently surged in popularity for advertisers as a new platform to communicate with prospective buyers. QR codes are more powerful than standard barcodes because they allow the transfer of complex information in a reliable and error free manner. Much more data can be stored and expensive scanners are not required like for standard bar codes. QR codes also offer a lower total cost of ownership to RFID tags and are easier to implement. All major smart phone manufacturers now provide apps to read QR codes. Implementing QR code technology does not require any licenses and is royalty free. Do it yourself software is also readily available for free that enables users to create their own QR codes . The Visec® QR module can work independently or in conjunction with the Visec ® IP camera security software application or license plate recognition (LPR) module. The technology is also available on a license basis to third party manufacturers that want to integrate QR solutions into their existing technology. Copyright 2019 Global Technology Asset Partners Inc. All Rights Reserved. All copyright claims to material are made in the USA, The African Union, European Union, The Republic of South Africa, and protected worldwide via the World Trade Organization on Trade-Related Aspects of Intellectual Property Rights (TRIPS) and the Berne Convention. Visec is a registered trademark of Global Technology Asset Partners Inc.